I do a quick math as I run down my memory lane. This is my third winter here that I am staying for the whole season. I’ve often cried right here in this very spot shivering in the winter coolness. Every morning, I woke up with heaviness in my heart, cloudiness in my brain, and sense of loss and hopelessness running wild through my nerves. I would put my winter coat and boots on and crawl my way slowly down to this place, to this playground. I made myself walk up the steps to the slide, and I would cry all morning without even knowing clearly what it was that was making me cry. 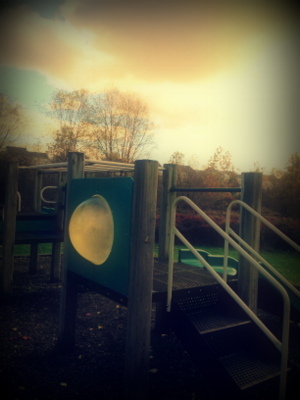 My winters of 2010, and 2012 at this playground were like that, though, my condition was much better in the year of 2012. There is no doctor more effective and talented as time. I will always remember the last few winters I spent here in Maryland as the period that completed my final healing of depression. It was here where everything I lost slowly began to come back: relationship, health, and work. I started to dream again like I did when I was a teenager. And every day I tried not to forget to thank God for what He has done for me, where He has led me, how much He has loved me. I know God has plans for me, for my being here at this time, in this particular place just as He has plans for everyone of us. And nothing is as liberating as discovering the simple reason of one’s existence. After all, it’s the question that has been bothering me as long as I can remember. I don’t cry any more. Instead, I thank God, always and everywhere. It will be my duty, this singing songs of praise and thanksgiving of my savior Jesus for the rest of my life. For that, I am sent here.I will always thank Him, but especially here at this playground.